You know it’s got to be cute! This is one of the sweetest patterns I’ve knitted. Super cute, super fun, easy to memorize. Just loved knitting it. And the tassels are the icing on the cake. The pattern even comes with excellent tassel-making instructions. Now I’m not normally a tassel or big yarn pouf on the hat kind of girl but this hat really works with the tassels. Gotta have ’em! This is my first time knitting with the much lauded Brooklyn Tweed Loft yarn. It’s gorgeous yarn though a bit fragile. I snapped it pretty quickly when tightening the stitches while switching from one needle to the other doing magic loop. But once I realized I needed to be a bit less rough with it and after doing a quick spit (well, I ran it under the tap) join of the break, all went smoothly. I love the tweedy colors. And as an FYI, the designer, Gudrun Johnston, answered a query on her Ravelry forum about the source of the pattern’s name (which I was also wondering) and it’s the name of a beach on the Shetland Islands where the designer grew up. It just sounds huggable to me but I’m sure it’s a lovely beach. hi, me too i’m knitting Norby….isnt it a wonderful hat pattern. 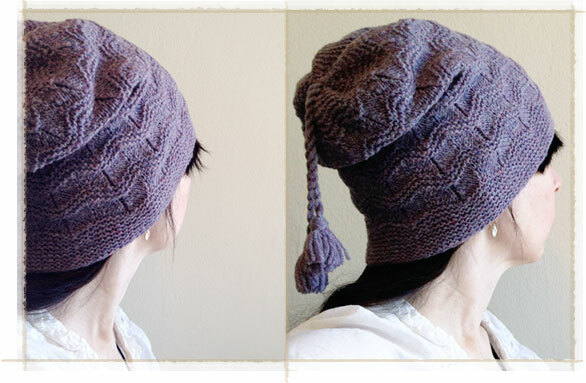 i saw the gorgeous purple Norby you knit for your sister on Ravelry….happy knitting ! Thanks Qiviut Queen. (I love Qiviut!) Enjoy your Norby. A lovely pattern! Hi, I absolutely love this norby hat…and i was wondering for the norby pattern, we have to purchase it right? or is there any place that has the free pattern? Sorry, this is a purchased pattern. You can get it from the BrooklynTweed website or on Ravelry here. Okay then! thanks! i purchased the pattern. But i am using red heart yarn. Excellent! I’m sure it will look great in the Red Heart!